The river rises up, rich brown, foamy and yielding, against the hull of boat. The boat is smooth and calm, and I’m enamored: its my first time seeing St. Louis from the waters of the River, looking up at our city. I’m on the Tom Sawyer, one of the riverboats that Metro operates on the riverfront of the Mississippi River. It’s a beautiful Friday afternoon, one of the most seasonable days in May, where the sun beats a warm St. Louis heat but with a hearty breeze and impenetrable sky. The perfect St. Louis afternoon, a few moments before a holiday weekend, to climb aboard a boat and tour the St. Louis riverfront. 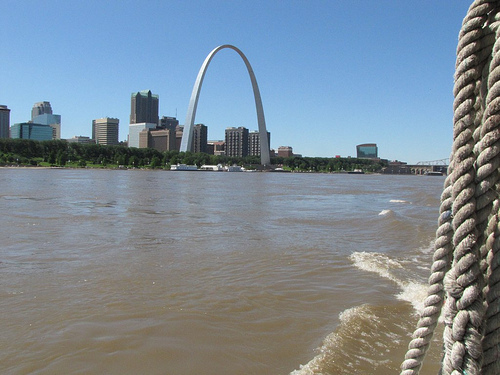 A view of St. Louis from the Mississippi River is perhaps one not many of us have experienced, but it was the first. Pierre Laclede and his assistant, Auguste Chouteau, staked out St. Louis in 1764 for their settlement near the Confluence of the Illinois, Mississippi and Missouri Rivers. Be not mistaken: We are a river town. Our history and identity runs and rides with the currents of the three rivers swollen and flowing as one. It brought us wealth and promise; it brought us challenge and compromise. The river was an essential form of transportation for early St. Louisans, but later posed an obstacle to improve the flow of people and goods. When you are on the river, you can see what an amazing contradiction this is: the River is strong and swift, but wide and intimidating. It’s amazing to realize that only 150 years ago, a major challenge was how to build a bridge long enough and strong enough to span the Mississippi. 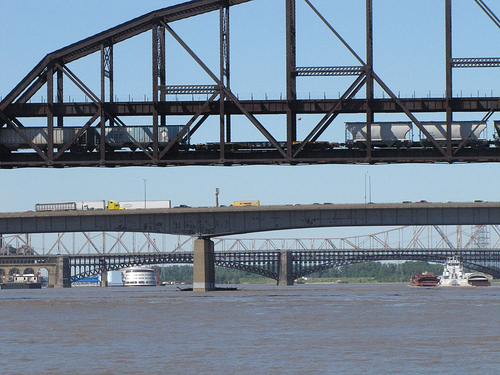 Now we are about to build downtown St. Louis’ sixth bridge: The New Mississippi River Bridge for Interstate 70. The tour is rife with buildings and structures that have continuing stories of decline and rebirth. 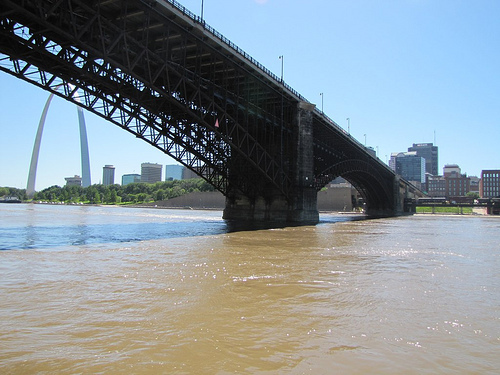 The Eads Bridge, one of the great architectural feats of the 19th century, was a commercial failure in its infancy. But its integrity, largely untouched by years of river wear, now carries MetroLink trains into the historic tunnels beneath the City of St. Louis and into the region. The Laclede Power Building, was constructed in 1901 to distribute electricity for the ballooning populations of the 1904 World’s Fair, is now being renovated to serve as the main “gateway” to The Confluence and as a trailhead for the Riverfront Trail. The Ashley Street Powerhouse, a darkly impressive structure that still generates steam for downtown St. Louis, bears both rich architectural detailing, and heavy coats of rust. And the Sligo Steel Building, set back from the river and nearly blocked from an elevated train track and river debris, is home to Sligo Steel, a company formed in 1834 that today is the oldest steel company west of Mississippi. This tour is not a Floridian coastline cruise; you are on the Big Muddy, looking upon a red-brick-loving Rust Belt river city. The beauty of the scenery is its history, and the perspective the river provides. The view from the river includes the five bridges crossing the wide waters: Poplar Street, McKinley, Eads, Martin Luther King, and MacArthur Bridges. Built during different eras, with varying architectural styles, to serve different growing transportation needs, these bridges are testament to the many ways St. Louis has grown and reinvented itself over the last 150 years. And the river keeps rolling on, watching us from below. The Riverboat cruise gave me a great perspective on both the past and present of St. Louis, while we may think things are slow to change, the region has actually undergone tremendous evolution to adapt to needs and opportunities. When you are sitting on the deck of a riverboat, looking up at the skyscrapers, the buildings, the bridges, and of course, the Arch and its grounds, it is impossible not to realize that our story keeps on going. And once the Mississippi River Bridge and the new Arch grounds are completed, the skyline will change once again. And at this moment, on this day, on this River, it’s a beautiful view of St. Louis. 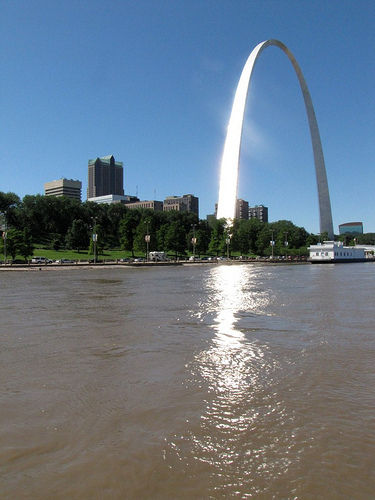 For more information on how to take a Riverboat cruise on the Mississippi River, book a group, or make reservations for one of their dinner cruises, visit the Gateway Arch website. Any chance, Courtney, that, if the Admiral should be removed, we might see one of the riverboats re-moored along Laclede’s Landing, to stretch out LKS a bit more and encourage more exploring along the riverfront from Arch-goers? Courtney — a curiosity on my part: how did Metro come to own the Tom Sawyer (and other) riverboats? How long has Metro owned them? What is their intended use by Metro (that is, why does Metro have them)? Do they _actually_ get used? I have seen a collection of riverboats just to the south of the Arch steps down to the water – are these Metro’s boats? I ask because I see so very few people actually on them. I also very very rarely see a riverboat working the river (i.e. cruising, not docked). Those are the boats, RT. It’s funny you say that you rarely see them cruising; I have an office that overlooks the river this summer and I keep seeing them going by and didn’t realize how MUCH they get used! I’m going to talk to the riverboat people and see if we can get some history and ridership numbers, though. Thanks for piquing my curiosity. The Riverboats were acquired by Metro in 2001 when they were going to be purchased and moved to Iowa or Illinois, leaving virtually no attractions on the riverfront. Metro, as you probably know, considers economic development as its main mission (transit, of course, helps accomplish and focus that). So the Commissioners decided that operating the riverboats would be a good fit with our other riverfront operations – the arch trams, the parking garage, and the reservation & call center. The money that was used to purchase the boats came from profit Metro makes managing the trams, garage, and the St. Louis Downtown Airport, so no tax subsidies were involved in the purchase. Regarding the operations, the boats make 5-6 trips a day, depending on whether there’s a charter scheduled that evening that would interfere with the sixth (6pm) trip. There are also private charters in the evenings, as well as public dinner cruises every night Wednesday-Sunday. The sightseeing tours on the riverboats run from March 1 through the end of November. They tend to sell out around 4th of July, I’m told, but generally you can just walk right up and get a ticket. Fascinating. I had no idea the main mission of Metro was economic development. I find that…somewhat disturbing and very shocking, actually. It would, however, explain why you have the other assets (CPS, garage, boats, etc), which was another query floating around in the back of my brain. I also suspect very few people in the St. Louis metro region know Metro owns the other assets, or realize it considers its primary mission to be economic development. If they are making 5-6 trips a day, I suspect the reason that I rarely see riverboats actually working the river is that I am usually only down that way towards the end of the day / evening. It would be interesting to see what the actual load factor of the boats is during a “normal” (meaning non-holiday) operating cycle. Sorry to come back to it, but economic development? Wow, I am just shocked. Thank you, Jennifer, for taking the time to dig up some answers for me. I hear what you’re saying, RT, but if you think about it, the number 1 reason people use the Metro system is to get to work (#2 – school). If transit is all about connecting people with jobs, then economic development is at the core. Now, you may be thinking “development” as in, building stuff. It’s true that St. Louis isn’t a hotbed of TOD, for instance, but we’re working on it. But take a look at the placement of the original MetroLink – it isn’t a tourist route that only hits major attractions. It’s serious business and connects people to jobs at the major job centers. When planning bus routes we try to serve the region’s major employers so people can get to work. That’s all economic development-related. Metro’s current website explains this a bit on the Agency Overview page. Jennifer — first, thanks for this discussion. Good information to have as we go forward with various debates, and helps to educate me on what Metro’s thinking is. We all want transit to be better, and we all want the area to succeed. But to the topic at hand. Its not really that economic development is Metros focus that bothers me. I’m well aware of the original route, and various reasons it was chosen. No, my issue is that if Metro feels that its primary mission is economic development, then IMO, the long range development plan you have put together is very, very poor. It also makes me wonder why Metro focuses on a “commuter based” system. An aside – in my view, Metro doesnt run public transit. It runs COMMUTER transit. There is an expression the British use, “turn up and go.” You can’t really do that on Metro outside ‘business hours’ during the week. You cant go to a bus stop, consult the posted schedule, and plan a trip any day of the week. Sure, you can use your mobile to get schedules, but dont plan to take anything on the weekend, and if you do, dont plan to be outside of the middle hours of the day. Dont plan on taking it expediently during off hours of the work week. It just wont happen. I have to plan a good deal in advance if I want to take transit out for an evening. And if I dont have an internet connected mobile – forget it. Back to the primary discussion, though. Metro’s mission is economic development. Fine — why then is the focus on buses and BRT? Yes, they both have their place, but anybody who has been around transit knows that the general public will almost always take a rail based system (streetcar or LRT) over a bus. In this case, I’ll focus on streetcars. Why do I bring this up? As has been discussed before, buses in this country outside of maybe NYC and Chicago have the stigma of being transit for poor people (among other things). If you are looking to develop an area economically, then one of your big targets is the middle class – people who CHOOSE transit vice being required to ride it. Developers dont build for poor people. By putting in a streetcar instead of a bus, you are adding infrastructure. Yes, its a little more costly (this isnt the discussion to talk numbers on streetcar vs bus), but you are also signaling to developers with your investment that you plan to be around for a while. The infrastructure is costly to install, but its ALSO costly to REMOVE. Its harder to take out a streetcar than it is to redirect or remove a bus. To a developer, that means their money is a little safer, since someone else (Metro, the city, etc) has also invested significant capital in the area. The risk is shared. What is my point in all this? If Metro really is focused on economic development, and transit really is part of the engine that drives said development – then its up to Metro to come up with transit that not only goes where people want to go, when they want to get there, but transit people will CHOOSE to ride. I long remember a field trip to the river in 1973 when we had a severe flood here. Back then everybody called the transit agency, Bi-State and the office was accross the street from the 39th and Park streetcar barn.